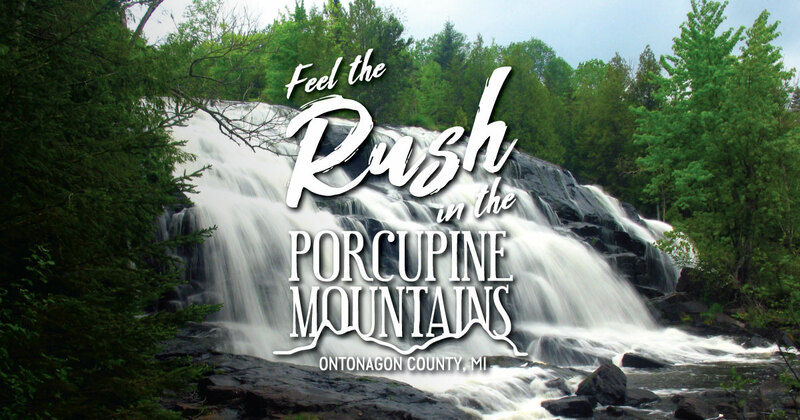 The Porcupine Mountains and Ontonagon County has some of the most spectacular scenery in the Upper Midwest, but there’s more to the area than wild waterfalls, vast forests and incredible trails. This is a place where adventurers of all ages can find unforgettable views, heart-pounding thrills and even a bit of mystery. Now is the time to plan a summer vacation like no other. See what’s waiting for you in the Porkies. At the edge of the Porcupine Mountains, you’ll find a lake that’s more like an inland sea. Lake Superior is the largest freshwater lake in the world by surface area, a fact you won’t dispute as you gaze at the endless blue horizon. This is a place of beach picnics, blazing sunsets and quiet reflection. If you’re daring, take a dip—the water can be a little crisp (or “invigorating”) during much of the summer. There’s nothing like a quick swim followed by some time in the sun. You’ll find 21 miles of cool waters and scenic shoreline at the edge of the Porcupine Mountains. After all these years, the debate continues. Is the Paulding light nothing more than car headlights? Or is it something spookier? (Local legends hold that the light is created by the ghost of a railroad brakeman, a mail courier or a Native American.) Try to solve the mystery for yourself at a roadside stop between Paulding and Watersmeet. Head there at night to see this spectral site. One of the oldest lighthouses in Michigan still stands sentinel on Lake Superior. The cream city brick structure stands three stories tall and over decades of service prevented untold maritime accidents. It’s been out of service for more than 50 years but it’s still an impressive sight. Lighthouse tours are available from May through September. In Greenland Township, you’ll find one of the best-preserved copper mines in Michigan. Visitors can choose from a variety of underground tours, from basic walking tours to a more daring tour that includes a rope descent. The mine hosts an unusual event: the Miner’s Revenge mountain bike race, which takes place July 15-16 and includes a thrilling trip through the tunnels.